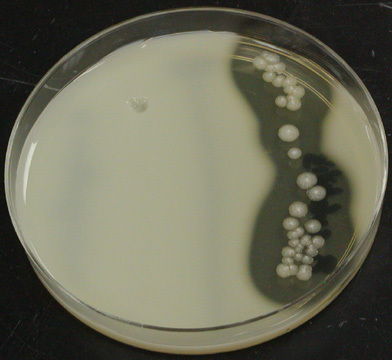 Skim milk agar is a differential medium that tests the ability of an organism to produce an exoenzyme, called casease, that hydrolyzes casein. Casein forms an opaque suspension in milk that makes the milk appear white. Casease allows the organisms that produce it to break down casein into smaller polypeptides, peptides, and amino acids that can cross the cell membrane and be utilized by the organism. When casein is broken down into these component molecules, it is no longer white. If an organism can break down casein, a clear halo will appear around the areas where the organism has grown.